I’ve wanted to do a tiny giveaway in order to say thank you for all the support I’ve had over on A Little Boat Sailing over the past year and a half. I don’t do these very often at all for various reasons however; every now and then I do think it is nice to give something back to those that contribute so much to my blog and indeed my blogging experience. I’ve recently reached over 600 followers on Bloglovin and GFC as well as passing a milestone of 100,000 views. Whilst this may be a small figure to many to me it is monstrous as I would never have thought my blog would reach so many people. Therefore, in order to say thank you I’m holding my first ever international giveaway, yay! 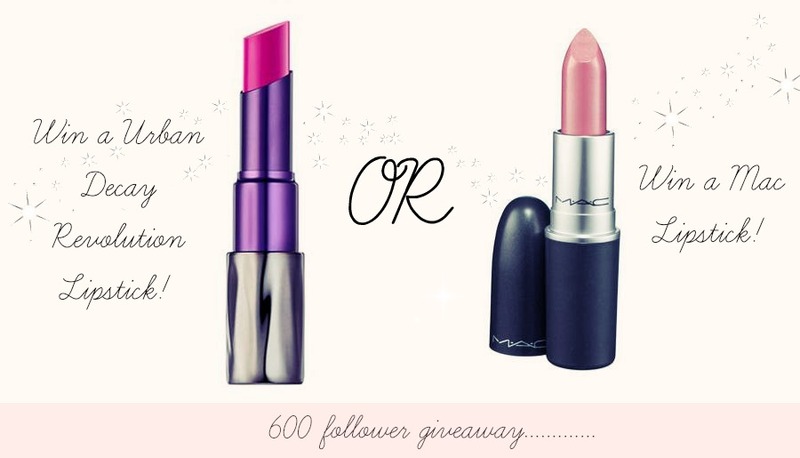 I promised the next one wouldn’t exclude anybody so I’m keeping to my word and offering somebody the opportunity to win an Urban Decay Revolution Lipstick of their choice OR a Mac Lipstick of their choice that is part of the permanent normal range. These are both the same value in money at £15 so it is down to personal choice from those who enter as to which one they choose. Please do leave a comment below stating which lipstick you would like, Urban Decay or Mac as well as what shade you would like. Along with this please leave some form of contact detail, this can be an email address or a twitter account; ensure it is something you use often so that if you do win I can get hold of you. Entries will be recorded through my usual method of Rafflecopter as I find this the easiest way of checking entries etc. Please no fake account entries at all as it is generally pretty obvious when they are. Remember it is international so everyone has the opportunity to enter and it is of course one lipstick from either Mac or Urban Decay. Good luck to everybody that enters, I only wish I could give every one of you a lipstick!